Starting in May we invite you to our free Sunday Brunch the first Sunday of every month from Noon until 3pm. There will be specially priced Sunday Brunch items. Come join us May 5th! Since the first one falls on Cinco de May, that will be our theme. Bueno. 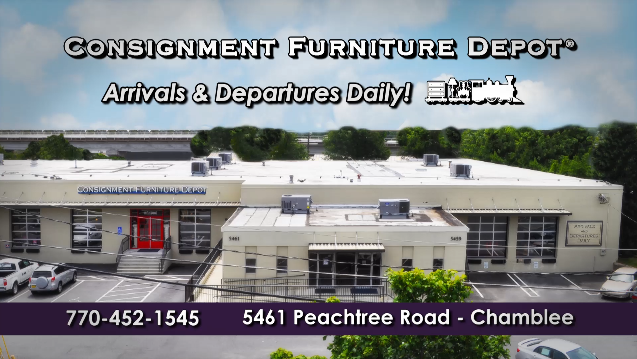 Consignment Furniture Depot ® is one of Atlanta's favorite home furnishings and accessories stores located on Historic Antique Row in Chamblee,(a suburb of Atlanta) Georgia. Our phone number is 770-452-1545. We are convenient to Buckhead, Atlanta, Dunwoody, Peachtree Corners, Norcross, and Decatur. Our address is 5461 Peachtree Road, Chamblee, GA 30341. See & Click the scrolling gallery below for New Arrivals added throughout the week. For a closer look at The Depot, click the arrow above to see our latest TV Commercial. That's our very own Marcia Sandford you hear in the jingle at the end. Thanks Marcia! Welcome to our website. This site is synched to our inventory system so you will see select New Arrivals as they are checked in and photographed to go on our showroom floor daily. Sold Items now drop off our website automatically within 20 minutes to ensure fresh information. While we try to post as many items as we can, the website should be considered a sampling of our offerings, so visit our store to see our full selection. Arrivals and Departures Daily! The Depot is Greater Atlanta's true consignment furniture destination. Our consignments are not a sideline to new furniture inventory, consignment selling is what we are all about. Watch here for announcements of future events. Click the links at the top of the page to connect to us on social media. Like Us on Facebook, Follow us on Twitter and Instagram and get on our mailing list and automatically get timely notifications of new arrivals and special deals. Still, savvy shoppers stop by often. Sometimes choice items are gone before we can get them photographed. 2 Drawer Kitchen Island w/Iron Trim - 48" X 22" X 34.5"